Personalized kid’s notepads are a real catch for those who wish to keep their kids indulged! These notepads are more fun than any cartoon characters and prime time television shows for kids put together. Kids can be encouraged to express their creative streaks through this old fashioned paper. We make it easier for kids to correspond through this visually indulging format that makes it equally enjoyable for parents too. 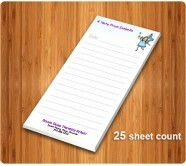 Custom kid’s notepads make a great gift choice for parents, children, babysitters, grandparents, etc. It can be a real fun for children, grandchildren and other important kids in your life. These notepads are perfect for story writing, at home and schools and it can be an ideal gift during school annual functions, birthday parties, appreciation events, etc.